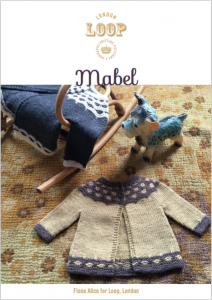 Home › Free Patterns › Mabel Cardigan – Free Loop Baby Pattern! We are so proud to present to you the latest pattern by Fiona Alice in collaboration with Susan Cropper of Loop London. Susan wanted to offer a baby pattern knit in this wonderful new yarn and had been knitting a version of Mairlynd’s Moonraker Shawl – she was completely smitten with the cluster stitches used in that pattern and thought it would make a natural lovely yoke for a cardigan. With a few sketches back and forth between the two, Fiona set her skills to work. Fiona tells us a little about her thoughts and process behind the design. Mabel was truly a collaboration between Susan and myself. Susan presented me with the idea to do a baby cardigan – actually my first cardigan of any size. I decided it was time to venture into the world of jumper design. We began by talking about her favourite stitches and textures and after that discussion, I was able to run with ideas. I knew I would be using Rico’s new Linea Botanica. Immediately I felt that these natural and delicate shades would find a special home in Loop’s colour palette. So I decided to let myself be inspired by the shop. I don’t have any small children in my close circle of family and friends so therefore I haven’t been inspired to design many baby patterns. I wanted a cardigan that would embody Loop’s vintage and playful aesthetic. I also drew inspiration from the many knitters who I’ve helped during my time on the shop floor. Novice learners to master gurus have passed through Loop’s doors and I wanted a design that might peak the interest of both categories of knitters. Hopefully adventurous beginners will be excited to tackle new stitches while enjoying the easy construction of a top-down cardigan. Perhaps experienced knitters will be intrigued by the detailed yoke and then a fast and simple knit for the remainder. Loop and I are quite excited to present Mabel to you, my first cardigan. Mabel, as a name, means loveable and dear, and it is my hope that this new design lives up to its name! Fiona is a brilliant designer from Nova Scotia, Canada, (and former Loopette!). She is the designer behind the beautiful new pattern ‘Phos’, knit in Chickadee by Quince & Co that is in the new Autumn 16 edition of Amirisu as well as our very own Blossom Bunting – another free pattern on our blog here, knit in The Border Mill for Loop. Fiona is currently back home in Nova Scotia but is hoping to return to London and Loop soon. Fiona Alice is also the author of Take Heart: A Transatlantic Knitting Journey – the very first book from Pom Pom press and a book we adore at Loop. We loved this new Rico yarn as soon as we saw it. 100% Organic wool and dyed with all natural dyes – what’s not to love? And it’s perfect for knitting and crochet for babies and children. It’s all natural right down to the labels and comes in six beautifully organic colours. And what could be better than a free pattern this adorable? Well a giveaway of course! 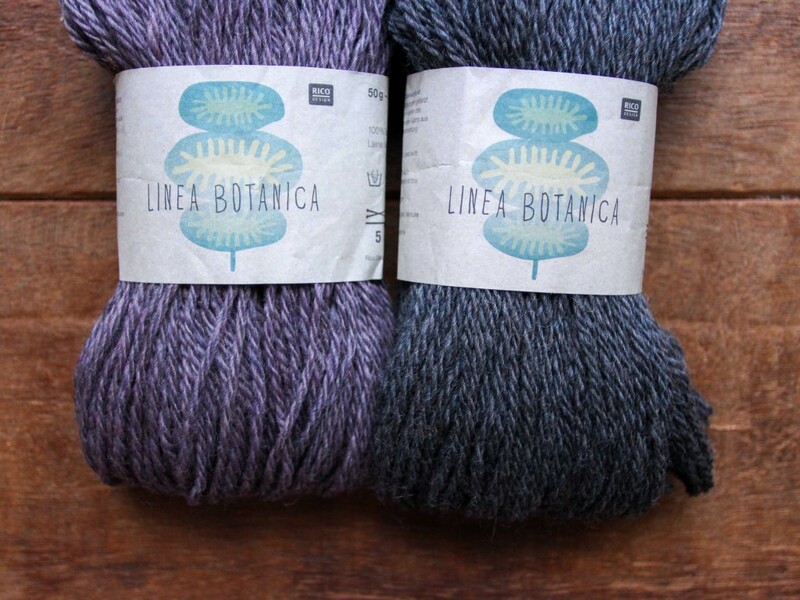 We have 3 skeins of the Linea Botanica up for grabs, enough to make either of the first three sizes. Simply comment below and tell us why you’d love to knit this lovely cardigan. This week you can even double your chance of winning by reposting our image on Instagram and make sure you use the hashtag #LoopMabelCardigan to enter the draw. This giveaway has now ended. To download the pattern, simply click right here or on the image below. Errata: There’s an error on the sleeve measurements in this pattern. They should be 13 (15, 18, 23) cm / 5 (6, 7, 9)”. Updated PDF will follow shortly. Photography and Styling by Susan Cropper. Tech edit by Rachel Atkinson. This pattern is the property of the designer, herein known as Loop Knitting Ltd. The pattern and images are copyrighted and are for personal and non-profit use only. This means you can knit it for yourself, for a gift or charity. You may not sell a garment made from this pattern. You may not reproduce this in print or for a website. It may not be translated, reproduced or circulated in another language without prior agreement. Thank you and enjoy your knitting! Sooooooooo cute! This will be a great pattern to make for my almost three year old niece for either her birthday or Christmas! I love the blue and cream vintage look too! When do we get the grown up version? I would love the chance to try this yarn as the colours look beautiful .I also want to learn cluster stich to knit this pattern. The Mabel pattern is so beautiful. It’s colourful, fashionable and would be a joy to knit and such a pleasure to see a baby wearing it. thank you for your pattern. It is gorgeous. I so want to knit this for my beautiful little niece! With two new grandchildren expected I shall be knitting this lovely cardigan several times! Perfect little stash busting cardigan. I don’t have little ones anymore but I would probably send it to Knit for Peace. Love the cluster stitch! I have two little girls that would look adorable in those cardis. Perfect Christmas gifts. Oh my friend is about the give birth and I would love to make this for her little one, imagine her in it at Christmas! Such a cute pattern, i knitted moonraker as well and loved the cluster stich. I will have a babygirl in November, so i would Love to knit mabel for her! I would love to knit this little beauty for my brand new first granddaughter Aria Slyvie. She is 2 weeks old and the most beautiful thing in our lives! I love this pattern so much and the gorgeous wool you’re giving away especially the Rubra shade. I would love to knit this for my eighteen month old daughter Alice, she is having problems with her eye and needs an eyepatch/glasses and a pretty cardigan to match would be the sweetest. This is lovely, the possible colour choices are exciting me. I’d love to knit a cardigan for my neighbour’s little daughter! Why is my previous comment awaiting moderation? I knit for my daughters a lot and I want to make matching cardigans for Christmas. This pattern is just perfect, a little bit more special with the beautiful yoke. Georgeous. My neighbour’s daughter would look adorable in this cardigan. I’d love to are one for her. this would look gorgeous on my little grand-daughter! This would make an adorable present for my gorgeous little niece! I love the mixture of colours, stitches and textures. It will be a pleasure to knit. Love this pattern and the yarn. I would knit this and then donate to my Mum to sell for her charity craft and gift stall at Christmas . Friends and family are starting to have grandchildren and I want to make baby presents. This is so perfect a baby cardigan! I would love to try this pattern in the yarn it was written to use! In what a sweet little cardigan. I have a pregnant friend who is due any day– she is definitely knit-worthy! I made her a layette set incorporating the baa-ble hat pattern for her sheepy nursery. This would be perfect for a first Christmas present! What an adorable cardigan – I can think of some deserving little girls who’d look fantastic in this. A perfect colour palette too – modern, vintage, feminine but not girly all at the same time! I love this sweater!!! I need to make three of them for my granddaughters — Nora is 4 years old, Fiona 2 1/2 and Penelope 8 months. I’m envisioning the Christmas card photo now! This is absolutely adorable! If postage wasn’t sooo expensive to Canada, I would order the yarn so I will find something here! This is going to be the perfect cardi gift for close friends! Thank you! The yoke is so beautiful! I have 4 little nieces who I love to knit for and I think at least one might need this sweet sweater. Thank you for making your lovely pattern free! The color palettes you’ve chosen are gorgeous! Oh I just love this cardigan!!!! Must see if I can knit it for someone…. Oh this is precious! I would knit this for my adorable 3 month old grandson Finn!! Both the yarn and the pattern are lovely. I would love to get to visit Loop but if the closest I came was to use this yarn and pattern inspired by the shop it might be the next best thing-plus my knitting friend is expecting twin girls! I would love to knit this for my granddaughter she is only 15 months and with the cooler weather coming I can imagine her wearing it with one of her lovely little dresses. So cute! This pattern has made me so happy. I have a new niece due in a few weeks so I’m going to make her the 0-6 months size and invert the colours so her big sister has a matching one. Perfect! I’d really love to knit Mabel for my little daughter… She’ll look so beautiful! A beautiful pattern and yarn. How great to see a design that is traditional and classic. Nothing better than seeing children in cosy handknitted cardigans/jumpers. Please can we also have a pattern for a boy….no little girls to knit for at present….all baby boys, but have downloaded the pattern for future use. Thank you. I fell in love with this beautiful cardi at the same time I saw! I have many little peeps around here (nieces, nephews and grandniece too!) and I love to knitt it for them! This is perfect yarn to knit a sweet little cardigan for a friend’s new baby girl. I think I might just have three suitable buttons in my button box, and you all have supplied the pattern. What an adorable pattern. I have just downloaded it. Unfortunately I won’t be able to visit Loop before Christmas this year, so to win this yarn would be fantastic. I intend to knit this for my granddaughter Hollie for her 1st Christmas. Gorgeous pattern and yarn colours! I’d love to knit this for my daughter, born on Wednesday. I’d love to knit up such a pretty pattern using this gorgeous wool – lovely colours. With THREE new babies coming in the family at the end of Feb/beg of March, this is perfect – the pattern and the timing – it’s serendipity! What a lovely elegant cardigan! I would love to make this for the little ones my good friends are starting to add to their families. Thanks for the pattern! I already have this on my must make list! I’m expecting our fourth baby next year after losing our third early this year, I am finally getting to the point that I’m feeling positive about this baby instead of just worried and more excited than scared and I need to actually start preparing hand-knits for our baby to be (after losing two, it’s hard to stay positive even when everything looks great and the baby is fine!). I already have the moonraker pattern but haven’t gotten to it yet and I think this would be a great introduction to the stitch pattern that made me purchase it in the first place! I am expecting my first baby in the spring, and this would be just the perfect little cardi to keep them snug! Lovely sweater!!! I’d love to make this for my 3 year old! I have been knitting the five-hour-baby sweater for nearly 20 years. So simple and knit from the top down. My friend Barb keeps pushing me to do something more advanced. This looks like it might be the pattern. I have printed out the pattern and am ready to knit the 2-4 size. Moving on up!! Matching outfits for my 3 years and 8 month old boys! The navy and white would go with their predominantly nautical wardrobe! I would love to knit it for my little granddaughter! Because the cute factor is amazing! Because I have a 3 month old baby girl and winter is coming!!! With our changeable Spring weather here at the other side of the world (Tasmania) and a new baby just arrived in the family a matter of weeks ago, this darling cardi would make the ideal garment to see her through to Summer. So beautiful and unique! Can’t wait to make one! I have two new adorable baby cousins. They are already outgrowing the new baby knits I made them so it’s time to start thinking about their Christmas knitted gifts. I would love to knit this for my niece for Christmas. I love the classic shape of the cardi with the interest of the stitch pattern in the yoke. It’s fabulous! What a lovely pattern! I can’t wait to try it. As always, Loop is ahead of everything in the knitting business. I will definitely try this new yarn, love the Taupe and Rubra. This is going to be for my little niece coming to the world in January. The Mabel cardigan caught my eye because it is charming in a classic yet modern design. Thank you for sharing. This cardi is just so cute. Think I will have to knit this for my newborn (who is now overdue). A wonderfully sweet cardigan to knit for my friend’s little one. 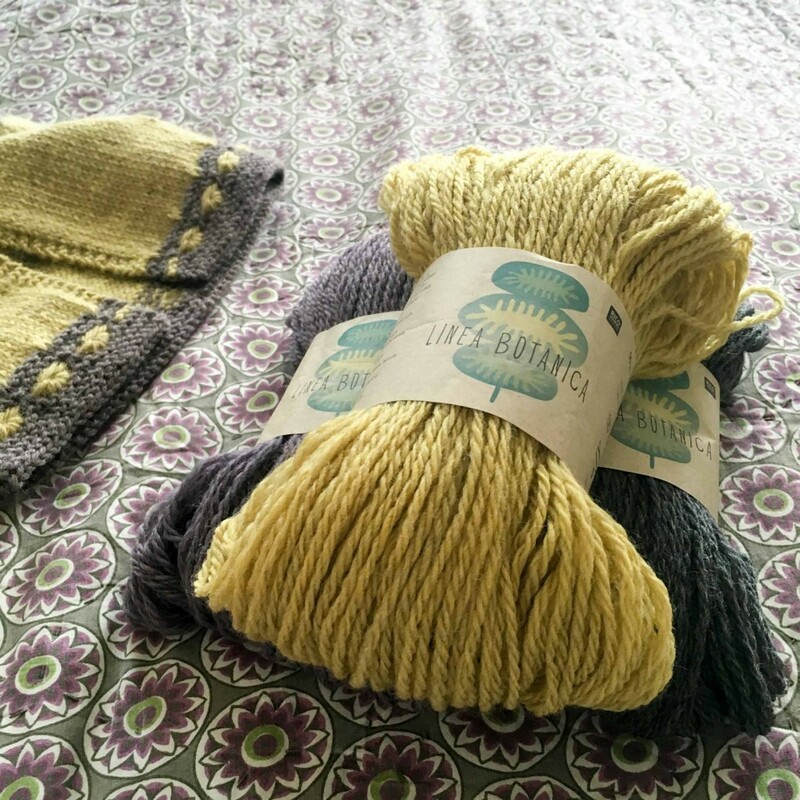 Love the organic wool and natural dyes as well–the perfect combination! I would knit my gorgeous Caitlin this beautiful Carrie in cream and blue, she would look adorable! Lovely pattern. Gorgeous pattern! Will definitely place an order for the wool for my 3 year old daughter. What an adorable little sweater – pattern is downloaded and waiting to be made up for my great-niece. Violacea is gorgeous! A beautiful and sweet cardigan. My grand daughter, Evelyn, NEEDS me to knit this for her! I have already cast this on for my 18 month old niece – such a lovely pattern. I’m going to see if I can figure out the cluster stitch! 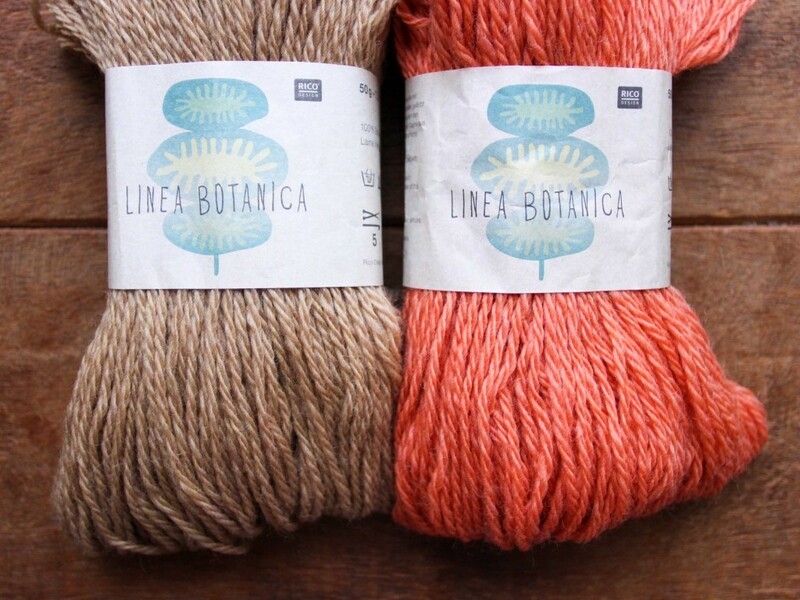 I would dearly love to knit the Mabel Cardigan in Linea Botanica yarn because someone was thoughtful in assigning botanical names to the colorways. Latin sounds so clever. And, like every knitter, my fingers fairly dance just looking at this luscious flower of a yarn. Hashtag Lovely Linea! 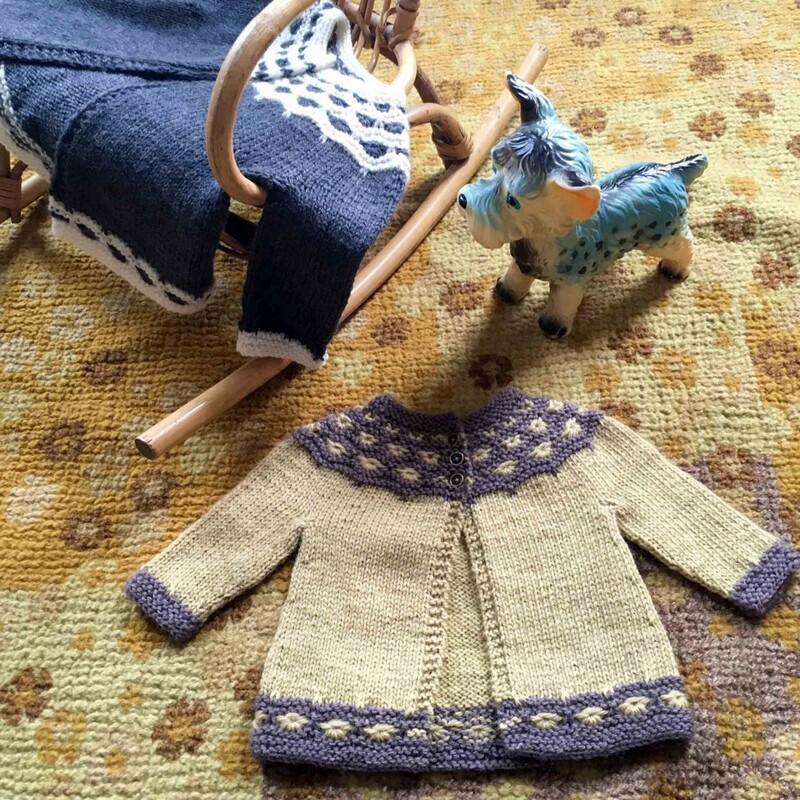 Such a wonderful combination- organic wool and a charming pattern, I love it all! What a lovely pattern to share with us! And I would love to try the Rico wool and upgrade my knitting skills. There are no tiny persons among family and friends right now but I’ll be glad to give it as a present when the occasion comes along. My childhood friend is having a baby in December. This would make a treasured heirloom gift. Oh how pretty. And lovely to have a new technique combined with some simple straight knitting for in from of the telly. The colours are beautiful! I’d love to win this yarn to make the cardigan for my granddaughter Cerys’s first Christmas. She’d look so cute in this! This is a beautiful pattern! I’d knit it for charity. This pattern is absolutely precious !! I have a new granddaughter and would love to make this for her…… Thank you for the pattern !! Super-cute pattern and the organic yarn looks absolutely gorgeous, I’d love to try it out and take it along to my knitting group. I’m a big fan of Fiona Alice and this is yet another beauty. Gorgeous! I’m so keen to make this! A cute project to try a new stitch pattern on and a video too to help me. This cardi is love with the first sight. I love the border details! It would be perfect knitting for my sweet niece! I have two adorable sons, perhaps one day they’ll give me an adorable granddaughter. You can’t be prepared to early can you? Just heard that my daughter’s best friend from school is expecting. She loves clean lines in both her home and her clothes, so I’d love to knit the version in Alba and Caerula. Love to knit in Flava&Rubra or Flava&Violacea or Rubra&Violacea…. This is adorable’ the cluster stitch looks great – can’t wait to try it. And the cardi looks like a top-down seamless, the only way I now knit, having done back, fronts, sleeves and sewing up for about 30 years. This baby cardie is just so cool and I am going to knit it for my beautiful Grand Daughter. She is not yet born ! Such a dear little cardi to knot for my great niece Elyzabel. Thank you! Of course I’d love to win the yummy yarn, but this is already a must-knit pattern. I knit a fair amount for babies and am always looking for a new Cardi pattern. I would live to knit Mabel. Love the yarn and the colours! My friend has just recently had a gorgeous baby girl, so I think a Mabel cardigan would be a lovely addition to her tiny wardrobe. 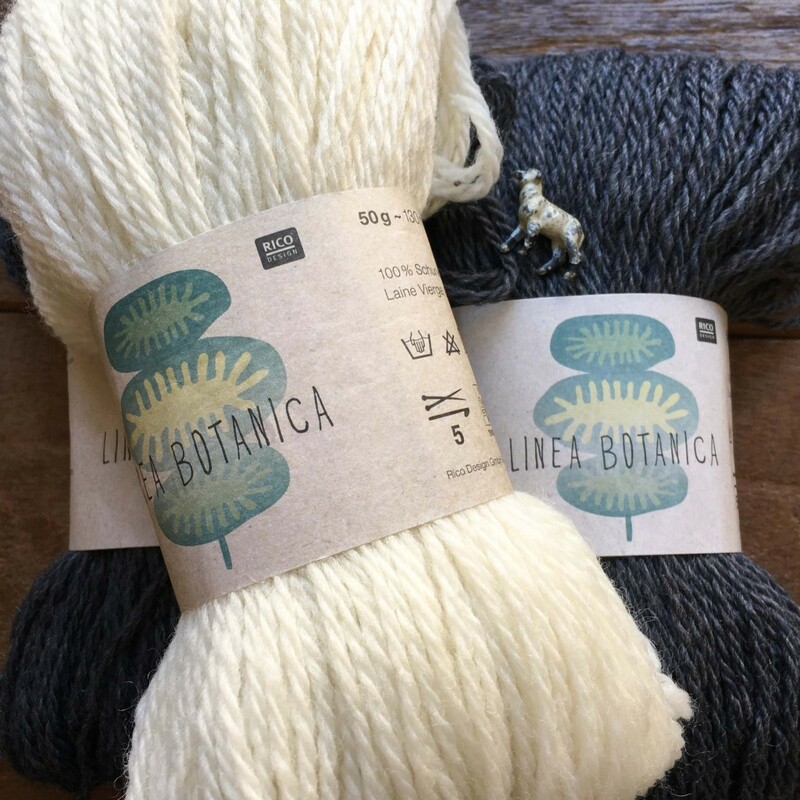 I would love to knit Mabel because (deep breath), I could squish the lovely Linea Botanica while I knitted – and I could hold its irresistable softness against my face, and smell the wonderful wooly fragrance of its pure Organic loveliness. If that wasn’t enough, I could feast my eyes on the beautiful colours, glory in each adorable little cluster stitch on the yoke, and knit up Mabel for the sweetest little baby you ever did see. What a stunningly beautiful pattern. Thank you for allowing it free! Can’t wait to try this. And the yarn suits tha pattern so well. Just stunning. 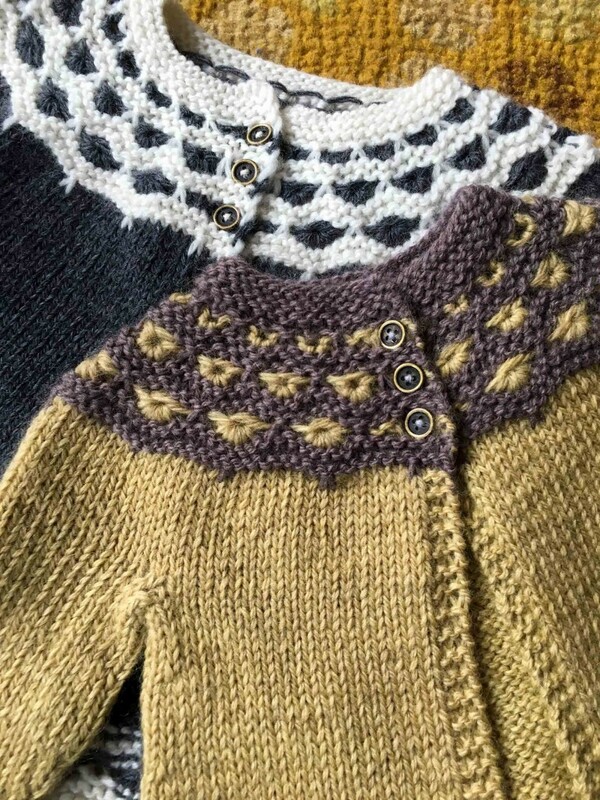 Gorgeous colors, adorable pattern and a never-ending progression of babies to knit for! Perfect! Thank you for a chance to win this lovely yarn. I love this! I’d love to knit it for my daughter. I’m trying to expand her hand knits this fall and winter and make some really gorgeous pics she can enjoy and save for future generations. This cardigan fits that perfectly. Thank you so much for the beautiful pattern! I would love to win the yarn, but will definitely knit this regardless. Love it! Thank you for the gorgeous free pattern knit in an equally gorgeous yarn! I would love to knit this for my beautiful great-niece who is two! What a beautiful garment – my 2 grandchildren would look lovely in matching jackets. Teaching school children to knit and this would be a brilliant lesson for the older children. I have a baby Great Niece due any day that would look adorable in this lovely Cardigan. I love the natural free spirit of the cardigan and the yarn used. I would be kitting this for a young first time mom and dad due in 3 months…the dad is an American Indian and appreciated natural fibers, I would be so honored and proud to present them with this masterpiece in any of you color combinations. What a cute sweater. Lots of babies on the way among my friends. This would be a perfect knit. I have two boys, but my friends in New England have a baby girl and I am discovering all the cute things to knit for a girl ! So beautiful! Would be perfect for my little girl . . . and I adore the yarn! This pattern is irresistible! I love learning new stitches, and to make this sweet cardi as a gift would be wonderful! I have two adorable grandchildren who would be even more adorable in this cardigan! My lovely friend Lucy has just moved to Hong Kong and is expecting a baby girl in late December. This lovely Mabel design would make the perfect gift! I’ve been knitting and crocheting for a few months now for a friend’s miracle baby. Would love to make this special sweater for a special miracle baby. Adorable pattern! This cardigan should be fun to knit. Why do I want to knit this? Because it’s beautiful! I love this so much!! I have many friends and family with babies, it on the way, that I’d love to make this for!! Beautiful cardigan! I would love to knit Mabel for a friend of mine that just had a precious baby girl & named her…of course, “Mabel”! Would love to knit this beautiful sweater. This pattern is so sweet! I learned to love making baby sweaters last year after my coworker had a baby. I would love to make another one, especially one as cute as this! My beautiful new granddaughter would look stunning in this. Her Mummy loves the hand knitted X clothes I make her. It’s so beautiful! I love the simplistic design with a tiny bit of contrast to catch the eye of any viewer. 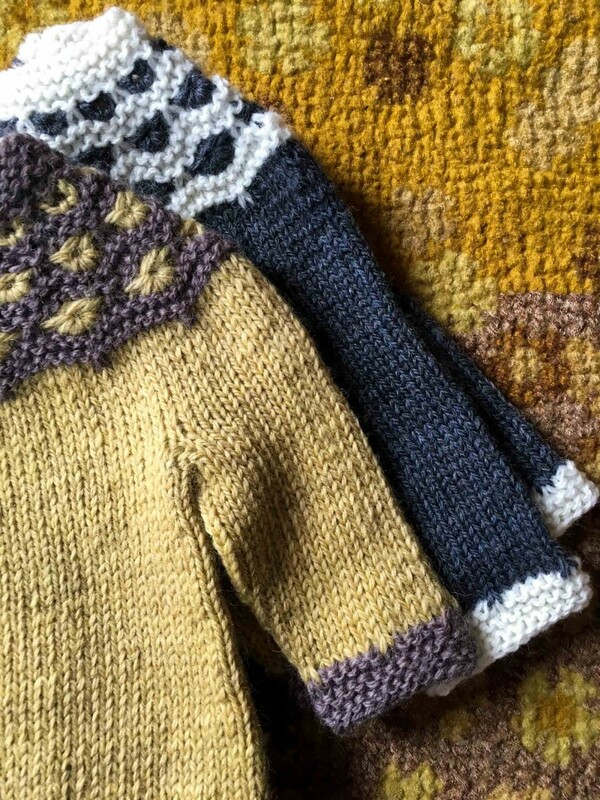 I adore the colors chosen and envision beautiful fall walks for wee one’s in the cardigan – three of my adorable niece’s may acquire one of these! I would love to knit this for my 6 mo old niece! It’s adorable! I’d love to win this as I have two week old premature twins in the hospital, and all this knitting for two is getting very expensive! gentilmente si puo’ avere spiegazione in Italiano ….? The yarn arrived earlier this week and is devine. Soft beautiful colours and delicate handle look forward to knitting it up. Thank you so much for sharing your adorable little sweater pattern. There’s only one request I have to make … could you please make the colour changes more clear in the pattern? I’m not sure which row to knit with which. It tells you to break B but not if you rejoin A or rejoin B again. Thanks, for listening. Is it possible to enlarge this cardigan to size 5? I would love to make it for my daughter who is 4y old, but on the tall side so just to make sure it will fit her. Had a problem obtaining correct tension usingboth category 4 &5 (Aran/worsted) but was able to knit a garment using your cluster edging in Category 3 yarns & metric 4mm (US6) needles. I find when knitting top-down garments that knitting sleeves first on straight needles is easier for beginner knitters so this hint may help some of your members in this category. Many thanks for sharing that great model. On row 14 [instert needle into next st, wrap yarn twice around needle, pull through and drop st off LH needle] Do you instert need into next stitch as if knitting or purling the st? I will forward this question on the the shop where you will get an answer. I just watched the tutorial for the cluster stitch in the Mabel baby sweater. I LOVE this sweater and I have watched the tutorial. Upon trying to knit it I am finding that after row 9 I don’t have the correct number of stitches on my needles. After the two rows of the cluster stitch tutorial, pattern says to knit row 10. I am obviously doing something wrong. Can you please walk me through the next step, the row after the tutorial. That would be most appreciated since I am at a standstill. Please email the shop or the group on Ravelry. This was my most favourite baby knit for my newest grandchild. I love this cardigan. I knit sweaters for all the babies born in our church and I’m a bit (well more than a bit) of a yarn snob. Is row 15 really an increase row? I’ve tried it and I get a major decrease. It is an increase row. Without more information, I can’t help you. Such a pretty pattern . My friend’s daughter has a new baby and I would love to knit it for. Are we supposed to knit 4 times the loops on row 21 to get the right amount of stitches? Hi Catherine! If you’re still having problems with this pattern, could you please send an email to shop@loopknitting.com and we can help you from there. Thanks!